"Put the national interest above their private pockets or get out." 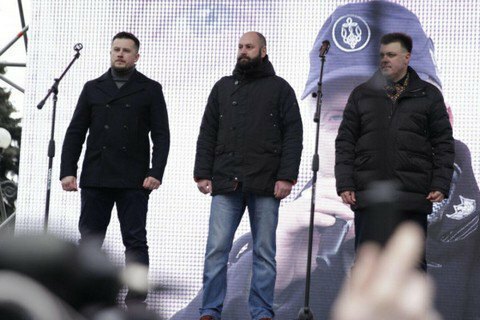 The marsh of nationalists in Kyiv held a rally opposite the Verkhovna Rada, where the leaders of the parties Freedom, the National Corps and the Right sector put forward their demands to the government. Svoboda's Oleh Tyahnybok said the nationalists demand the abandoning of trade with the occupied territories and Russia; privatization of strategic enterprises and nationalization of those that have been privatized; the refusal from the introduction of the land market in the country and further increases in utility tariffs. He said the rightist parties require early presidential and parliamentary elections. Tyahnybok said the incumbent parliament must adopt a law on the elections on open party lists, appoint new members of the Central Election Commission, adopt a law on impeachment - and leave. "Either you put the national interest above their private pockets or get out," said Tyahnybok. According to him, the nationalists are ready to come to power and have the "inner sense" of how to govern the country. "We are not just capable of overthrowing this government of profiteers and stop the Kremlin dwarfs in the east, we can change the world. We are a nation, we have proved that we can and want to. We have demonstrated our European aspirations and now have to prove that we will change this country and the whole world for the better," the leader of the Right Sector Andriy Tarasenko said in his turn. Tyahnybok, Tarasenko and leader of the National Corps Andriy Biletskyy headed to the parliament to file the ultimatum of the rally.